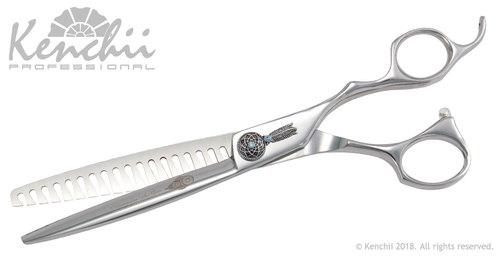 This beautifully crafted shear was created by Master Groomer Sue Zecco in collaboration with Kenchii Professional. The Dreamcatcher features a unique external assembly dial with a molded dreamcatcher with light blue stone accents. This Dreamcatcher shears are made with Kenchii level 3 metals with an offset handle for comfort and a convex edge recommended for finishing work. Available in: 8” straight, 8” curved, 18-Tooth reverse Blender, and 36-Tooth Thinner (total length 7”). Who is Sue Zecco? 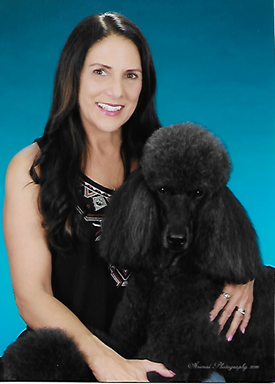 Sue is a Certified Master Groomer with both National Dog Groomer’s Association and the International Professional Groomers. She is a member of Groom Team USA, and has many grooming competition wins including Intergroom’s International Groomer of the Year. Sue is the proud recipient of many Cardinal Crystal Achievement Awards, including Groomer of the Year, Judge of the Year, Speaker of the Year and the Congeniality Awards, as well as the recipient of 7 Barkleigh Honors awards for Speaker, Judge and Congeniality. Sue and her husband Ray breed Standard Poodles under the “Dreamcatcher” prefix. They own and operate The Pampered Pet Grooming Salon in Paxton, MA.